This special issue of the GEOTRACES eNewsletter represents a new type of newsletter, a sort of “discovery digest”, designed to highlight the progress in a given GEOTRACES-relevant topic. Indeed, it is broadly known and generally accepted that research is a slow process and that knowledge progresses step by step. However it happens sometimes that putting together pieces of the “under construction puzzle” reveals a new image that completely changes the current understanding of any research issue. This is the case this early spring regarding the oceanic cycle of iron. A sudden storm of papers came out almost simultaneously in the most prestigious journals (including 4 in Nature journals and 1 in PNAS). Fe is a nutrient as essential as nitrogen (N) or phosphorus (P) for the phytoplankton. In other words, the full understanding of any marine ecosystem cannot neglect the analysis of micronutrients anymore. Fe oceanic sources are multiple, and supply from continental margins extends far beyond the coastal zone while striking Fe inputs from hydrothermal activity along mid-ocean ridges were observed in all the oceans. This revolutionizes the preceding view of the dust inputs, although those are essential drivers of N2 fixation at low latitude. The cycling of organic iron-complexing ligands has also emerged as a crucial component of the ocean iron cycle, ligand concentrations being not as uniform as considered earlier. It is also recognized that phytoplankton can exhibit substantial variations in their iron stoichiometry in different environments. Synthesizing these new insights provides a more refined picture of the ocean iron cycle, challenging the global ocean modelling for testing hypotheses and projections of change. The authors also draw exciting new frontiers for the oceanic Fe cycle. 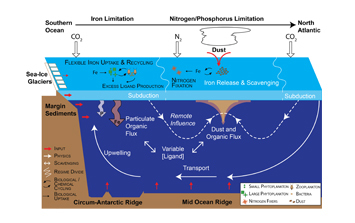 What controls hydrothermal plume transport of iron over 4000 km in the deep Pacific Ocean? 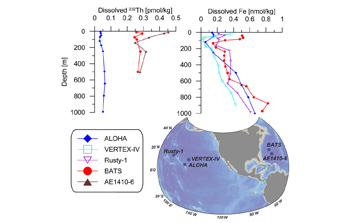 The striking extension of the dissolved iron and manganese plumes over more than 4000 km from their hydrothermal sources along the US GEOTRACES East Pacific Zonal Transect (EPZT) cruise (GP16) has challenged our understanding of these element cycles (Resing et al., 2015 see GEOTRACES science highlight about this paper). Fitzsimmons and co-workers analysed the particulate iron and manganese (Mn) in the same plume and showed that they also exceed background concentrations, even 4000 km from the vent source, despite anticipated gravitational settling losses. Both dissolved and particulate Fe plumes deepen by more than 350 m relative to the conservative helium-3 (3He) one, while the Mn plumes do not show such descent. 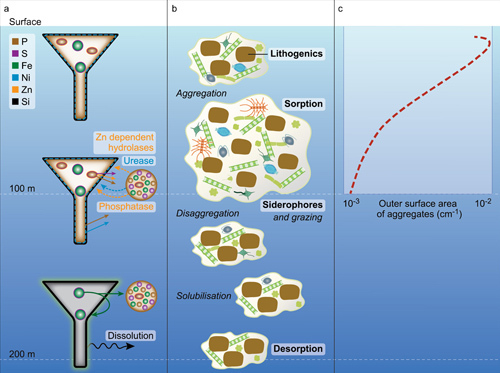 Based on Fe speciation and isotope data, the authors suggest that dissolved iron fluxes and geospatial positioning may depend on the balance between stabilization in the dissolved phase by organic ligands and the reversibility of exchange onto sinking particles. What constrains the hydrothermal dissolved iron isotopic signatures? 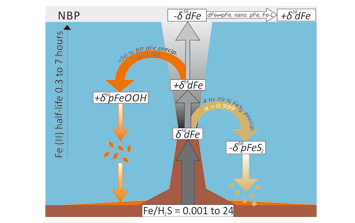 Assessing the processes leading to dissolved iron (dFe) isotope fractionation in a hydrothermal plume is a key question, because it allows a better characterization of this specific source of dFe in the deep ocean. For the first time, Fe isotope composition of dissolved and total dissolvable Fe fractions was determined and compared to the bulk chemical composition of Fe particles. This work, conducted on the same hydrothermal vents on the East Scotia Ridge, yielded two articles simultaneously published in February 2017. These complementary papers demonstrate that the dFe isotopic composition observed at the end of the plume dispersion in the deep seawater is quite different from that of the pure fluid. Changes of this signature reflect redox processes, ligand complexation, exchanges with labile particulate Fe. They more specifically reveal that the proportions of authigenic Fe-sulfide and Fe-oxyhydroxide minerals that precipitate in the buoyant plume exert opposing control on the resultant isotopic signature of dFe found in the neutrally buoyant plume. Although the isotopic composition of stabilized hydrothermal dFe in the East Scotia Sea is distinct from background seawater and may be used to quantify the hydrothermal dFe input to the ocean interior, these studies underline the fact that the multiple processes occurring during the early stages of the plume depend on the nature of the ridge substrate, more specifically its sulfur (S) content. The potentially highly variable isotopic signature of hydrothermal dFe is an important consideration for the mass balance of dFe in the modern ocean and for using Fe isotopes to infer changes in the Fe cycle throughout past Earth history. 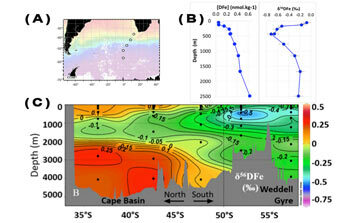 Abadie and co-workers propose new dissolved iron concentration and isotopic composition distributions (DFe and ICFe respectively) along the Bonus-Goodhope International Polar Year (IPY) section (GIPY4), in the Atlantic sector of the Southern Ocean. DFe vertical profiles display a continuous increase with depth (see figure B), classically interpreted as due to biological uptake at the surface followed by remineralization at depth. However, heterogeneous profiles of ICFe (see figure B) suggest a more complicated story driven by distinct processes, discussed here for the first time. Indeed, the authors demonstrate that in the intermediate waters, DFe primarily originates from remineralization of organic matter and the redistribution of this regenerated DFe through mixing. Moreover it is also due to horizontal advection of DFe released by reducing sediments of the nearby South African coast. The scheme changes deeper, where abiotic processes are dominating the DFe distribution as for example non-reductive release of DFe from lithogenic particles. This last process would add an additional source to the global oceanic DFe budget, which should be considered in the biogeochemical models. In addition, it suggests that the oceanic DFe budget could be more sensitive than previously thought to continental erosion, particle transport, and dissolved/particle interactions. Dissolved thorium (Th) isotopes and iron (Fe) are used to document the transfer of lithogenic material to the ocean. Two contrasting areas are compared: the Atlantic Ocean around Barbados Islands, under the influence of the Amazon plume and dust of Saharan origin, and the remote North East Pacific Ocean, far from dust inputs. The Amazon is a substantial source of dissolved 232Th and iron (Fe) to the low-latitude Atlantic Ocean, even as far away a 1900 km from the river’s mouth. This complicates the use of 232Th as a dust proxy in river-influenced ocean regions. A striking feature is the similarity in Fe concentrations from the North Pacific to the North Atlantic Oceans, while 232Th reveals a dust flux six fold higher in the later. This supports the idea that dissolved Fe distribution is highly buffered in the ocean. Boyd and co-workers explore the abiotic and biotic mechanisms that underpin internal metal cycling. Although they are focusing on iron (Fe) as the best-characterized metal, they are also discussing zinc (Zn), nickel (Ni) and copper (Cu) behaviors. 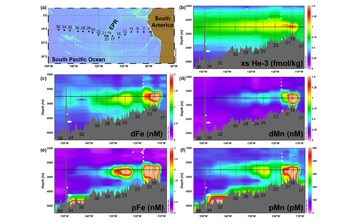 Based on synchrotron X-ray fluorescence (SXRF) mapping and case studies in different biogeochemical areas of the ocean studied in the framework of GEOTRACES (productive Kerguelen plateau, seasonally oligotrophic subtropical waters, oligotrophic Bermuda and Hawaii waters), they reveal contrasting recycling patterns between trace- and macronutrients, explaining why remineralization length scales differ between elements. They also underline that external supply mechanisms of metals are required to complete their biogeochemical cycles. Phytoplankton development is strongly linked to the dissolved iron availability in the surface waters. Iron’s behavior is sensitive to warming, stratification, acidification and de-oxygenation. In a changing ocean, these processes in addition to nutrient co-limitation interactions with iron biogeochemistry will all strongly influence phytoplankton dynamics. 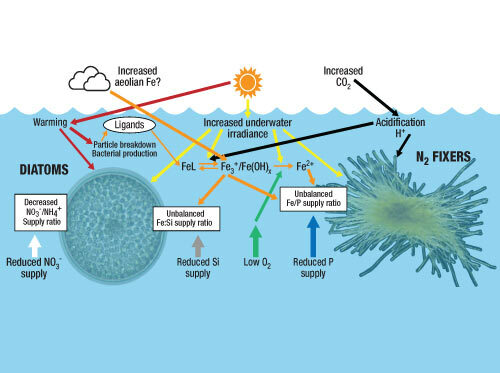 This paper establishes the potential future shifts in multiple facets of iron biogeochemistry, from cellular physiology to ocean circulation. Possible impacts of these multiple changes on diatoms and trichodesmium are illustrated in the figure below. This work warns us on the urgent need to improve our present knowledge of the micronutrient cycle forcing, in order to better predict their future behaviors. Did you like this special issue?